In this season where so many gardeners are starting their flowers and vegetables indoors, here are some thoughts on peat pots commonly used as containers for seedlings. Several seedlings (zinnias, melons, castor beans, etc.) 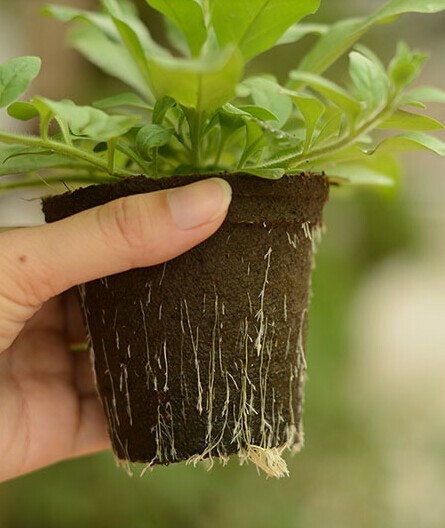 have fragile roots and can suffer during transplanting if you sow them in plastic pots or cell packs because this exposes their root ball to damage as you try to replant them. This is where peat pots come in. 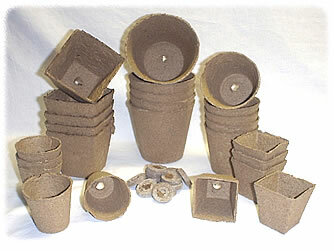 These round or rectangular pots are made of pressed peat with a bit of added wood fiber. They are strong enough to use as plant pots, but unlike plastic pots, they are porous, letting air and water circulate… and also allowing the roots of your seedlings to grow through them. You’ll actually see the roots penetrating the wall of the pot as they grow. To use peat pots, simply fill them with your favorite seed-sowing mix and moisten well before sowing. Then sow the seeds, water and take good care of the seedlings until planting time. When that time does come, all you have to do is to plunk the pot into a planting hole, without removing the pot, and cover with soil. Water well… and your seedlings will continue to grow without slowing down, as they were never subjected to transplant shock. Not only will the roots grow right through the walls to establish themselves in the surrounding soil, but the pot itself will decompose over time, leaving no trace in the soil. This is so simple you might wonder why I’ve even bothered to explain it. Well, that’s because there are always people who manage to get it all wrong and then proudly publish their errors on the Internet. There is no logical reason to pull the bottom off a peat pot… yet this advice is widely shared on the Internet. Here’s one bit of dumb advice you’ll read on the Web: “you have to tear the bottom off the peat pot before planting so the roots can grow down into the soil”. Wait a minute! The roots are already growing through the bottom of the pot. If you remove it, you’ll damage them… and didn’t we just say peat pots are designed specifically for plants that have fragile roots? Just plant the whole pot: there is no need to tear anything off! Worse yet, some people suggest peeling the entire peat pot off. Yet more nonsense! If you intend to remove a pot at planting time, why use peat pots at all? Plastic pots and cell packs are easier to remove and can be reused year after year, so are therefore cheaper. Use them if your eventual goal is to remove the pot. There is something you might want to tear off a peat pot, though. When you transplant the seedlings in peat pots, you have to be careful to bury the entire pot. If the top edge sticks out of the ground, it will act as a wick and dry out the root ball. So if any of the pot does show, yes, you can tear that part off. Let me repeat something before closing: peat pots are an added expense to growing plants from seed and one of the main reasons gardeners sow seeds is to save money. 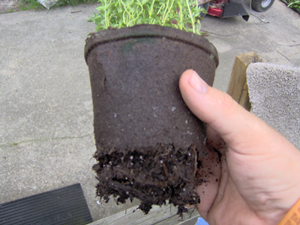 Peat pots offer no benefit whatsoever to the majority of seedlings compared to plastic pots or cell packs. 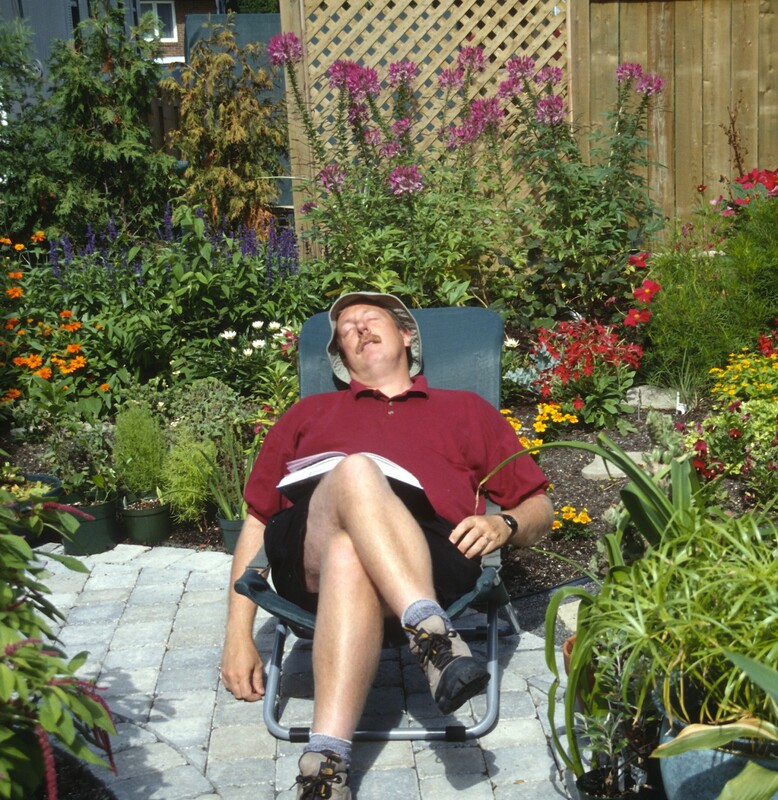 It is simply wasteful to sow tomatoes, petunias, marigolds, and most other garden plants in peat pots. Reuse and recycle other containers for their care. Keep peat pots for those seeds whose fragile roots would otherwise make transplanting difficult. The following plants all have roots that are either very fragile and therefore absolutely need to be sown in peat pots or fragile enough that they will be set back considerably if the root ball is mishandled when transplanting. Don’t Tiptoe Through the Tulips!